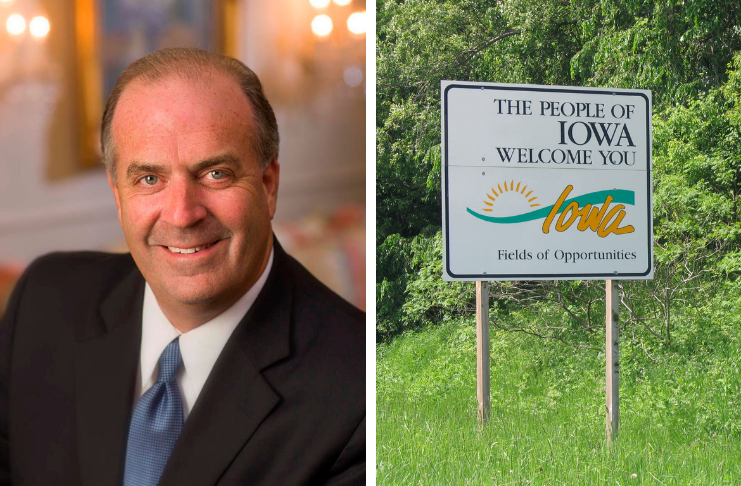 Yes, Dan Kildee went to Iowa recently. No, he’s not running for president in 2020. Just before Michigan’s August 2018 primary election, U.S. Rep. Dan Kildee (D-Flint) turned up in Iowa. He was campaigning for now-U.S. Rep. Cindy Axne (D-Iowa), a Grand Rapids native. The senior member of Michigan’s House Democratic delegation also visited Iowa in the fall of 2017. Any time a politician spends time in the Hawkeye State — home to the first-in-the-nation presidential caucuses — pundits flash the eyes emoji. (This reporter, it should be noted, lived in Iowa for a decade and covered the caucuses for years). And Kildee does have a national profile between the Flint water crisis and fight to free former Marine Amir Hekmati from an Iranian prison. But in a recent interview with the Advance, Kildee nipped any 2020 presidential speculation in the bud. Kildee said he believes that Michigan will be “one of the handful of states that will determine who the next president is” and he welcomed another presidential debate in Flint, as there was three years ago during the height of the water crisis. The congressman said there’s still “economic anxiety” in Michigan. While President Donald Trump’s record of tax cuts for billionaires shows he’s not sticking up for the little guy, Kildee noted that the Republican’s 2016 campaign rhetoric appealed to enough Michigan voters to take the state. Kildee also talked about whether he’ll endorse for president and what Democrats have to do to beat Trump in Michigan next year. In a previous story from this interview, Kildee talked about serving in congressional leadership, the new Democratic members of Michigan’s delegation and giving Trump’s job performance an “F” so far. On future editions, the Advance will cover Kildee’s assessment of what Flint still needs to recover and how to prevent future government shutdowns. Michigan Advance: The presidential election seems to be in full swing. As a veteran of the Iowa caucuses, I couldn’t help but notice that you took a little trip there last year. Do you have any interest in running for president? Kildee: No, I really don’t. I’ve been to Iowa a couple times in the last several months. Every time I go there, I get a little jab from one of my friends or some of my family. We’ve got a lot of great candidates and potential candidates running, so no, I don’t see myself getting involved in that other than to maybe support somebody if I feel like there’s someone that I should get involved with. Michigan Advance: But you have to know that any time anybody takes a trip to Iowa or New Hampshire, the speculation starts. Kildee: That is true. Yeah. That is true. In the interest of full disclosure, I was in New Hampshire once over the summer, but it was on my way to Maine for a vacation. Michigan Advance: So far, whose campaign for president has impressed you? I know more people will be jumping in, but of the field so far, who’s made an impression on you? Kildee: It’s really early. My initial impression has just been there’s just a lot of enthusiasm on the Democratic side. That enthusiasm is demonstrated each time of these candidates announces. It’s just good. I wouldn’t put anybody in any position of primacy at this point in time. I just think the energy on the Democratic side is really good and that’s why you see so much enthusiasm. Michigan Advance: Do you expect that you will end up endorsing in the presidential race, or are you still going to wait and see? Kildee: It’s hard to say. For those of us who are involved in all this … it’s hard to not get involved if we think there’s somebody who will do a better job of speaking to the needs of our state. That will be the variable for me. If my getting involved increases the likelihood that we’ll have a nominee that gets Michigan and understands Michigan, then I’ll get involved. If not, I’m committed to electing a Democrat president and I’m gonna do everything I can to make that happen. Michigan Advance: In 2016, there was a Democratic debate right in Flint in the midst of the national attention on the water crisis. Do you think there’s a chance that you could see a debate there again in 2020? Kildee: I would welcome it. I don’t know what the likelihood is, because those decisions are made between the candidates, for the most part. But I would welcome it. I think Michigan is a state now that is one of the handful of states that will determine who the next president is. I’m hoping that the campaign recognizes that. Michigan Advance: What does the Democratic presidential nominee have to do to win Michigan in 2020, especially after Trump won the state in 2016? Kildee: I think they have to speak to people who work every day, and feel like they’re working harder and falling harder behind. I think they need to basically depict to that person an agenda that is an economic agenda that gives them the confidence that their kids are gonna have opportunity and that they’re gonna be able to retire. In other words, somebody can speak to the kitchen table economics, who can communicate to those people, those individuals, in a way that makes them feel that somebody has got their back. [And] isn’t gonna be all wonky, isn’t gonna speak in Washington language, [but] is going to speak to them in their homes and make them feel as if we’re gonna work together to try to build an economy that works for everyone. We have to be honest, even though Donald Trump is, in my view, wholly incapable of understanding what people who work every day go through or doing anything to make their lives better, he’s demonstrated no capacity to do that, during the course of his campaign, that’s what he talked about. That’s what he told them. He was going to bring the jobs back. He was going to make American great again. He was going to do all these things, which was just a bunch of rhetoric. The idea that he would say he’s going to drain the swamp, stand up for working people — and them immediately appoint a group of completely disconnected billionaires to run this government, and push through a tax bill that is clearly tilted for the wealthiest Americans — just shows that he was being complicit all along. But the campaign — people were frustrated. They didn’t feel like they were being heard and he spoke to them. For whatever reason, he was able to persuade enough people to marginally win the state of Michigan. That is something that will be the source of a lot of retrospection on the part of people in Michigan for a long time. What we need is someone who can, with credibility, speak to those folks, who has a track record of actually standing up for them, not just the Twitter account that stands up for them [like Trump]. Michigan Advance: How are you feeling about Democrats’ chances now after the party had successes in Michigan in 2018? Do you feel like Democrats made headway in winning back some of those voters and are well positioned for 2020, or is it still anybody’s race to win? Kildee: Well, I think we demonstrated that we can win. We demonstrated that if we put out candidates that represent our shared values and have them speak to those voters that they’ll reward us with a victory. But I don’t think we can take it for granted. I think many of the same elements that were in place in 2016 are still there. There’s still a lot of economic anxiety. There’s still a lot of people who want to shake things up because they don’t think the system works for them. What we need to be able to do is connect with them. The one thing that you can say is that Donald Trump said he was gonna shake things up, and he did, but he just didn’t shake it up for working people. When he shook things up here, it wasn’t for them. We’ve got to make that case. I think [now-Gov.] Gretchen Whitmer made the case and won pretty decisively, and that’s a positive thing. The fact that we picked up a couple of congressional seats, I think also is a good omen for Democrats. But we can’t take that for granted. We’re gonna have to fight for every vote.